I want to show you how to do one of the most impressive physical feats a guy can do, and that’s the human flag. The human flag pose has long alluded many because we simply don’t practice moving our body in this position often, and why would we need to? Well… we don’t necessarily. But if you want to be the most impressive guy in the room… it’s a good start. One thing that makes the human flag difficult is having excess body fat, which equates to useless weight that won’t help you hold yourself up. 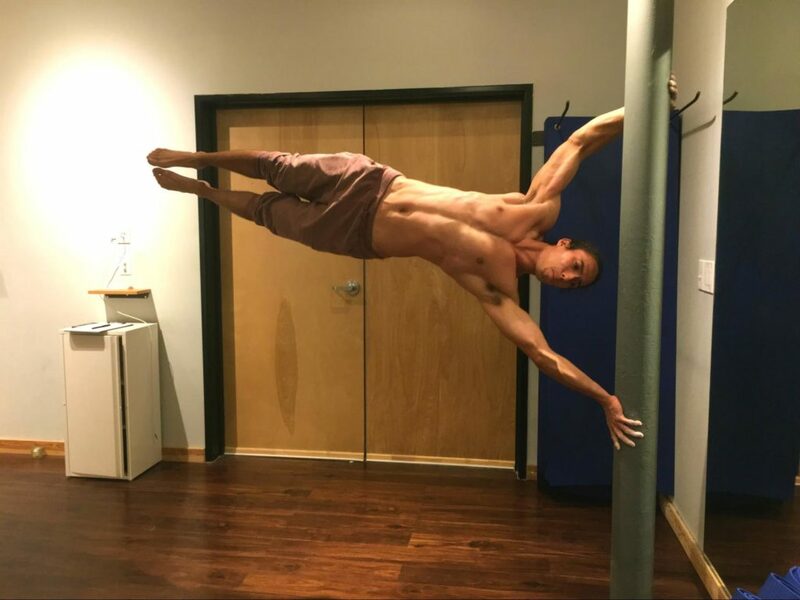 If you can reduce the amount of body weight you’re carrying (especially in the mid-torso and below), you make the human flag a bit easier. Not sure how to quickly drop your belly fat? Check out this free 28 Day Guide for dropping body fat while improving functional strength. 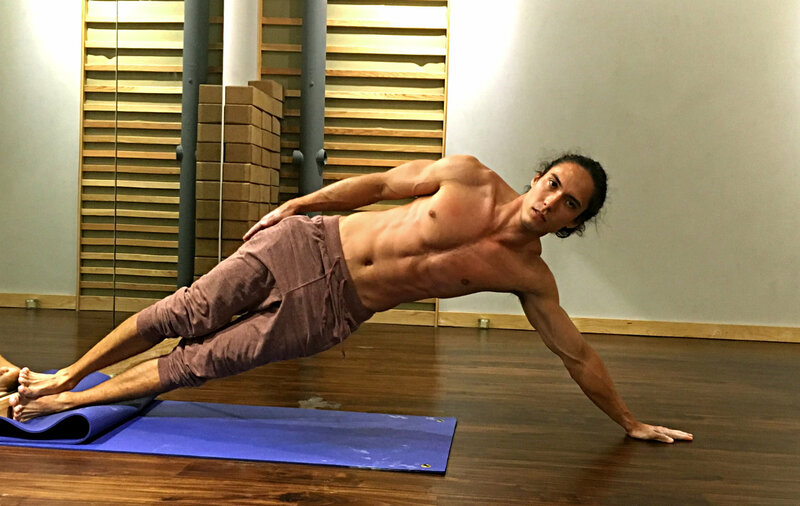 The other way to improve your strength-to-weight ratio is improving your strength, of course — and as promised, I’m going to show you the best exercises to do this — specifically for the human flag. For comparison, our most powerful movements like squatting, lunging, pushing, and pulling things away from or toward your body happen in the sagittal plane… which explains why those muscles tend to be a bit bigger (like your glutes, quads, pecs, and back). Maybe you’ve heard the saying “form follows function,” and that applies here too — we have developed a form (our musculature) that follows the functions we perform most often… Like the ones in the sagittal plane I mentioned earlier: walking, squatting, pushing, and pulling away from and toward the body. This is why the muscles that mostly function in the frontal plane aren’t naturally very big — because we haven’t evolved to do much moving in that plane. And this is also why it’s so tough to do the human flag. Humans haven’t evolved to have ridiculously strong obliques, lats, and shoulders. We can train ourselves to, but we certainly don’t leave the womb that way. Anyway, enough about why it’s so difficult – because regardless of that, I’m going to make sure you have the resources to your human flag. The training is relatively simple — we will mimic the movements as closely as possible. You may find that a lot of people you see doing a human flag have been gymnasts in the past. Coincidence? Definitely not. They spend a lot of time learning how to produce strong forces from their shoulders to master handstands and handsprings, PLUS they develop the stabilizer muscles to hold these handstands, and those help tremendously in the human flag, too. Handstand Pike PushUp: If you’re not quite comfortable being completely upside down, you can bring yourself to an L position by propping your feet up on a box or surface as if you were doing decline push-ups. Walk your hands forward so that your hips are above your shoulders and start the push-ups from there! Handstand Push-Up: Against the Wall: Again, if you have trouble holding steady in your handstand for now, just take it to the wall. I recommend wearing socks so that your shoes don’t scuff it as you press up and down. Full Handstand Push-Up: First of all, you absolutely don’t have to be able to do a full handstand push-up to do the human flag. However, the toughest and most advanced movement in the handstanding series (until you try one-arm handstands, that is) should be performed just like it sounds. From a handstand, lower yourself until your head is almost to the floor. Try to keep the neck straight so your spine isn’t contorted with your neck extended. Some may find this easier to start in a headstand and push-up — this is acceptable too. Include one of these exercises 2-3 times/week for 3 sets of 8-10 reps. The natural progression should be handstand pike push-up → handstand push-up against the wall → full handstand push-up. Just like those gymnasts we talked about who have powerful and stable boulder shoulders, they also get a lot of work for their “latissimus dorsi” or for short, the lats. These are our biggest and most powerful pulling muscles, and they help us pull in both the sagittal and frontal plane. For example, pulling a heavy door open toward you is a sagittal plane movement, and doing a pull-up is a frontal plane movement. And like I said before, you need to train these groups in the frontal plane, so be ready for some pull-up action to prepare yourself to raise your human flag. 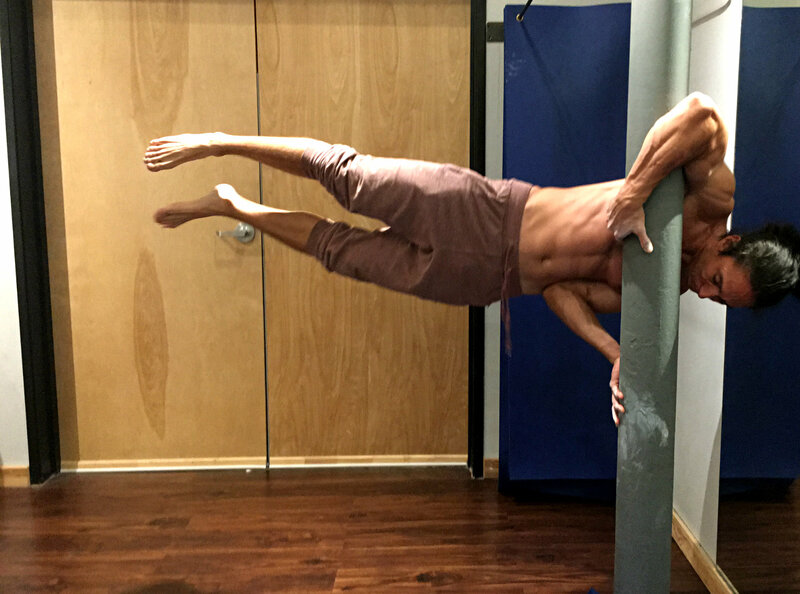 If you can’t do a pull-up already, you’ll need to spend some time training before trying the human flag. I recommend being able to do at least 3 sets of 10 pull-ups to verify you have the lat strength and endurance to master the flag. Your best bet for improving the frontal plane lat strength will be performing wide-grip pull-ups with your palms facing forward. Turn it up a notch and make the negative (or eccentric) movement extra slow by taking 3 seconds or longer to lower yourself back down to the starting position. By simply hanging from one arm, you’ll get your body accustomed to holding its own weight in a fully extended position (as it will be in the human flag) and help yourself improve the shoulder and lat mobility, synergy, and stabilization. 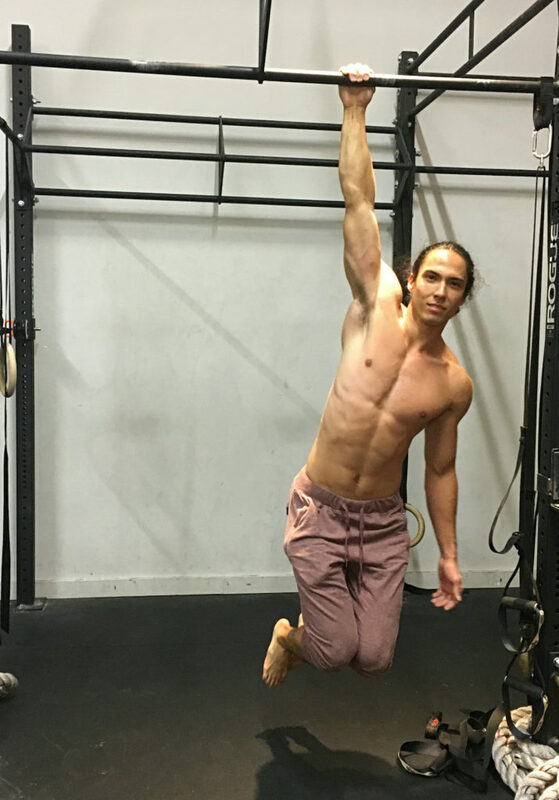 You may feel like a monkey, but this movement will incorporate all of the necessary muscle groups you need to train for your human flag. Hanging by both hands, use your left arm to try and push yourself away from the bar while you pull yourself toward it with the right arm. Don’t let your elbows bend very much because you want the lats and deltoids to do the majority of the work. As you pull with the right side, tighten your obliques to try to raise your legs (keep them straight and together) slightly. Repeat on the other side. Swing back and forth while you repeat these movements on each side, actively understanding how it feels when you contract these human flag muscles all together. Take a second for each side to hold the contraction and try to keep your legs at about a 45-degree angle. Last, but certainly not least, you need oblique strength to hold up the weight of your legs in the human flag. You may have a decent understanding of your obliques, but a lot of times in abdominal training, we use twisting movements to train the obliques… And if you haven’t caught on by now, those twisting movements aren’t going to hit the obliques in the frontal plane, which is the direction in which we need to develop strength. Now, don’t stop training them this way, because that twisting movement is just as important as any… but make sure you also include the following exercises to prepare your obliques for the human flag. The basic, beginner’s exercise to strengthening the obliques. You can do this from the elbow or hand. Turn the intensity up and incorporate more of your lats by positioning your arm further up past your shoulder. Instead of having your arm directly under your shoulder like it should be in the normal plank, move it “up,” or further away from your feet. Here’s where you step into the big leagues of the flag! 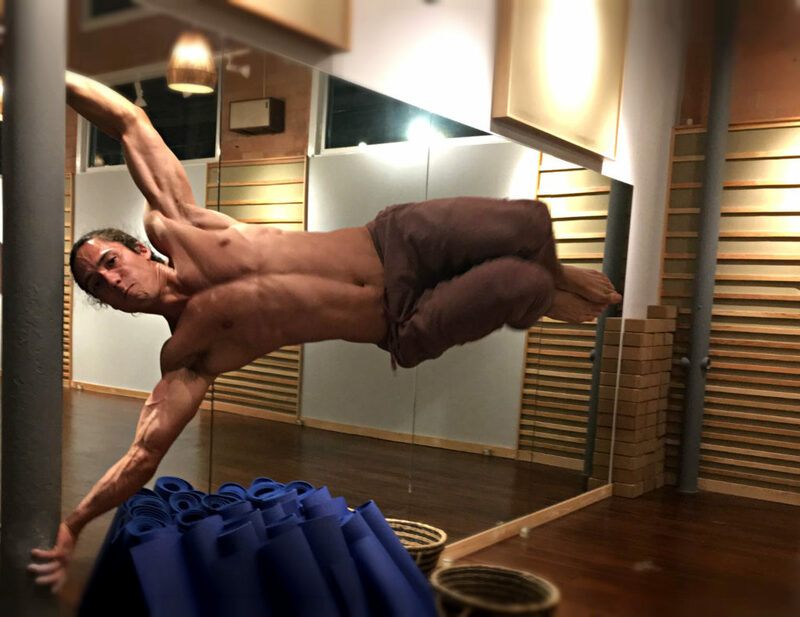 This is a major progression step for the human flag because now you will actually be propping yourself up with your upper body and using your obliques to hold your legs up. Find an appropriate and strong bar on which to practice. Standing with the bar to your left side (you’ll eventually practice on the right, too), wedge your left elbow underneath your ribs/waist by pushing against the bar with your hand. Take the top arm (your right arm) and wrap it over the bar, so that you can squeeze the bar between your arm and chest (see photo below). Once you’ve got your arms set and you feel strong, you’ll try to pull yourself up with your right arm and obliques, while pushing yourself up with the left arm, which should also be wedged under and supporting the left side of your body. Reverse this process for the other side of your body, because you’ll want to be able to do both sides to keep your strength even. Once you can do this version of the Human Flag, you’re very close to the fully extended version! To get into this position, you DON’T have to worry about being a pole dancer. Instead, you just need to rely on your ability to kick up and stabilize yourself. You can follow this girl’s lead and grab the pole with your feet for stability. Once you are here, practice trying to lower yourself down into the horizontal position. It’s okay if you can’t make it all the way; just try to lower yourself with control a little bit further every time. This is about as simple as it gets. Have a friend help you into position while they hold your feet up – and slowly let go while you get used to the feeling of holding your body up. By bending one knee, you slightly reduce the amount of force that your muscles have to produce to keep you up, which makes the flag a little bit easier. It should look something like the photo below. You can get into this position fairly easily from the vertical flag. So this is the progression that my friends and I have used to accomplish the human flag, and I wholly trust that you can get there too. Just give it the necessary time and dedication, and keep your mind on those lats, shoulders, and obliques… In no time at all, you’ll be able to do one of the most impressive physical tricks in the history of mankind. For more fitness and nutrition tips to get an awesome six pack, get a lean and ripped physique with minimal equipment… Check out my blog at sixpackabs.com. Mastered this? See if you can do my other 8 toughest ab exercises!